Last year I came close to seeing the iron furnace, but no cigar! The road to the furnace looked like it was running out of pavement and there was a big dip that we would have to cross, Rose Hammitt, my travel buddy and I chickened out and never made it that trip south. This year though we had the opportunity to attend a tour for travel writers and the Illinois Iron Furnace was on the agenda. On our bumpy ride there Todd Carr, our tour guide and member of the Hardin County Main Street (along with Carol Hoffman of the Southernmost Illinois Tourism Bureau) assured us that we were taking Furnace Road, the back way and that the “other” road was much better. The news of the iron ore deposits started a viable industry that survived on and off until 1880. Iron ore, a mineral block found underground created a viable industry for years after White and Gurard built the furnace. Iron ore is the most common mineral used to make tools and armor and after it is mined requires the smelting process for iron ingots or in this case, pig iron to be formed. Because some of the rock was used, the furnace could not be rebuilt completely. 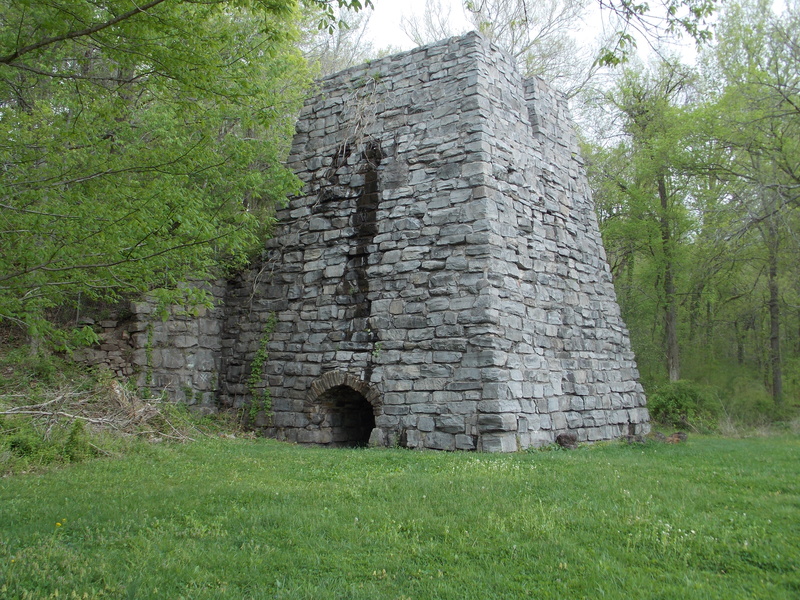 The current appearance of the Illinois Iron Furnace is due to a reconstruction in 1967. The reconstructed furnace core is solid, having been filled with rubble and concrete. It is hard to believe when looking at the remains of the furnace today that this was once a thriving community with a ground shaking, blasting furnace that was a major contributor to the local economy. It is helpful to have a bit of history before heading out to the furnace because the placards explaining the history have been removed because of lack of funds. More are to be replaced sometime in the near future. I was vindicated by the amazing history of the furnace, Rose was impressed as well although she didn’t have the attachment to the site that I did! As fore mentioned, be aware that roads to the furnace are a bit sketchy, but the history makes this a great chance to see a one of a kind history in Illinois. Log onto http://www.theshawneenationalforest.com/home/recreation-areas/iron-furnace-recreation-area for more information.